Between 1998 and 2001, she worked in Osaka, Japan on the Universal Studios theme park with her husband, Larry. Their memoir of that experience, "31 Months in Japan: The Building of a Theme Park," was published in 2005 and was a finalist for the 2006 nonfiction EPPIE award and named as one of Rebeccas Reads best nonfiction books of 2005. They have written two mysteries together: "Murder… They Wrote," published in 2009, and "Murder in Paradise," published in 2010. The latter was a finalist for the 2011 EPIC eBook Award in 2011. They are currently working on at least two more in this series. Along with authors Sherry Derr-Wille, Luanna Rugh, and Christie Shary, Lorna wrote several romance anthologies: "Snowflake Secrets," finalist for the Dream Realm and Eric Hoffer Awards, "Seasons of Love," and "Directions of Love" winner of the EPIC eBook Award for best romance anthology of 2011. The group added debut author, Cheryl Gardarian for "An Aspen Grove Christmas," and group is currently working on three more anthologies. Look for "The Art of Love" coming soon. "Ghost Writer" is Lorna’s first solo effort, and her favorite book so far. Today she and Larry are retired and reside in Dana Point, California. Recently unemployed computer programmer Nan Burton has had a series of setbacks including losing her job, her apartment, and her car. So, when she inherits a California beach cottage from her great-great-aunt, she is really delighted since she has loved the old cottage since she was a young girl. But while moving in she finds one big surprise: the house is haunted by the ghost of famous romance writer Max Murdoch (pen name Maxine DuBois). Max says he can’t move on until Nan completes his last novel. What comes next is a new beginning for the one, and a realization of things from the past for the other. Once in a while you select a book to read thinking you might find in it something you like. In this case, I say yes and double yes. 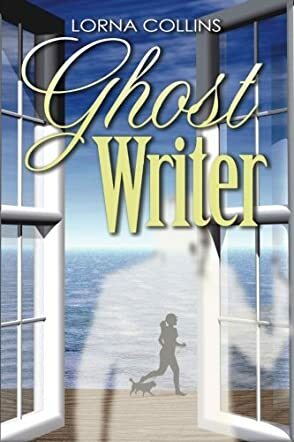 From the beginning I found "Ghost Writer" to be a very well-thought-out, formatted, and plotted story that kept my interest from the first page on. I quickly began to like the characters and saw them grow as the story progressed. The plot was simple but well-designed although just a tad predictable in one or two spots. The dialogue was first rate, and as I read I could see Max sitting in the chair by the fire commenting as he watched Nan hard at work on the manuscript. After completing the story, I still found it hard to try to classify it by genre. Yes, it is a ghost story, but so much more. If you are looking for a pleasant read, you can’t go wrong with this book.